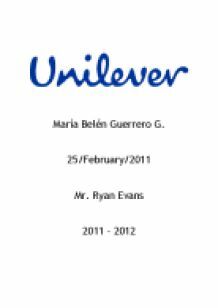 ï»¿María Belén Guerrero G. 25/February/2011 Mr. Ryan Evans 2011 - 2012 María Belén Guerrero G. April 4, 2011 UNILEVER In 1930 two multinational companies called: “Lever Brothers” and “Margarine Unie” joined to form UNILEVER, a british-dutch multinational, multilocal and multicultural corporation that actually operates in more of 180 countries all around the world with approximately 163 000 employees. This corporation is a private company, which means only friend and family members can buy, focus on how products can help or make easy the activities of people and their personal care. Unilever products are in the lives of over 2 billion people in the world every single day; these products give a great feeling of satisfaction in three different categories Food, Personal care and Home care or hygiene. Unilever worries about the well-being of the people, their products are highly recognized around the world, as I say the majority of people used unilever’s products more than once in one day. Some countries in which Unilever operates are: Brazil, Argentina, Bolivia, Canada, Dominican Republic, Ecuador, Nigeria, Egypt, Ghana, China, Australia, India, Indonesia and others. This company has principles and purposes to accomplish, in this case the objectives of Unilever are: Always work with integrity, positive impact in many ways through brand, commercial operations, and relationships. Continuous commitment to improve the way the company manages environmental impacts and develops a sustainable business; other purpose is setting out their aspirations and gives the opportunity to others with the same highest standards as the company has. ...read more. Other benefit of globalization is Communication, it improves as globalization grows, and this can be demonstrated in Unilever factories, where all the departments need to be communicated about all the production of one day. If there are problems, immediately employees need to tell to the manager or supervisor of the area to solve the problem and be more efficient. Another big and positive impact of globalization on Unilever is the development and improvement of the technology as I mentioned, this helps to the productivity of the company. Also, helps to improve the quality of the products, investigating about new ways to produce a new or better product. 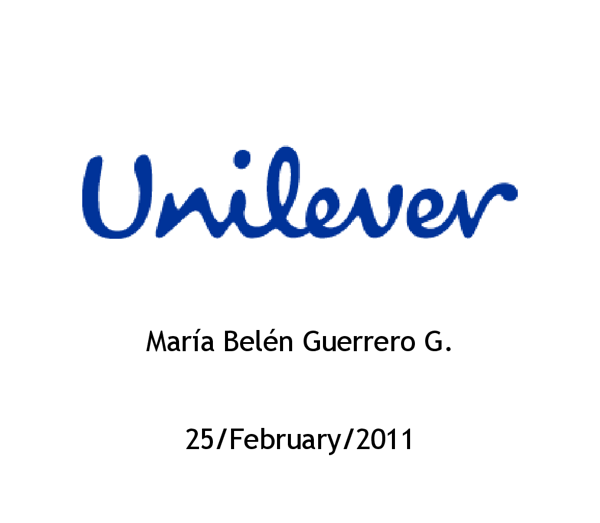 So, with this advance of technology, Unilever can be more recognized around the world for their high quality products. Here globalization produce another benefit for the multinational, if their products are high quality and recognized around the world, this means sales can increase , which means the company can grows more and this produce job for new people that requires . Globalization brings positive effects but there are negative too. Examples of negative effects of globalization are the competition between multinationals, as a company is more recognized in the world, there will other companies that want to do the same as Unilever; the other companies will operates in different countries to compete in the same position. Other example of a negative effect of globalization is that cause that the multinational can?t expand in other countries that there?s no established because of the lack of experience and control to administrate a big company like this in a new place where they do not how are the regulations from government to work there. ...read more. The competition between the big multinational and the small firms make that the small businesses close because is not profitable to their owners, this also cause unemployment the stagnation of the economic development in Mexico. Unilever does not permit that the small firms can take advantage of the market opportunities. In conclusion, Unilever is a big british-dutch multinational, multilocal and multicultural corporation founded in 1930 and is operating in 180 countries, with the mission of?Give vitality to life? and satisfies the needs of customers. This big multinational focus on products for personal care, home hygiene and nutrition (food) of high quality, Unilever worries about hygiene and well-being of the people, their global objective is to make their life easy through their brands. Their products are highly recognized around the world and have more than 120 brands. Unilever is not the company that worries just for the profits and the development of itself, Unilever worries about the society, communities, and environment. The company created different activities such as campaign, projects, support charity institutions because in this way can help to the communities in remote areas of any country and the environment. The company has achieved success despite all the problems they had, it is one of the ethical firms around the world with corporate responsibility. Their executive officers have the necessary managerial skills to guide Unilever to the success and with the capacity to solve any problem with efficiency, create job for people that require and develop the economy. Each day, this multinational works investigation new way or products for society needs, to help them in their daily life, which means Unilever will become better in the future. ...read more. Existing customers still do require a high quality product but they are not a very big company so will prefer to keep quality to a minimum in order to reduce their costs. Another performance objective will be the speed from M&S ordering the cards to Wace Burgess delivering them and M&S receiving the products on time. 4.1.3 Efficient manufacturing and logistics facilities Jollibee's production site is clean, efficient and located strategically surrounding their chain of restaurant. It is semi-automated and raw materials such as buns, chickens, beef and cheese are supplied fresh from the local market. It has computed $975 per annum or less as the GNI (classified as low income) for the developing countries and $11906 or more per annum (classified as high income) for the developed countries and the differential in this drives the labour force of the developing world into the developed ones. Operation/Production The production quarter of the business would be looking after taking orders producing the software and hardware in addition to this they will be taking information from the customer services what customers want, and what are customers willing to pay for. What leaders need to do is motivate the staff to come into this discomfort zone. The staff needs to feel safe and that is possible by creating the right environment and culture. The employees need to see 'what's in it for me'?